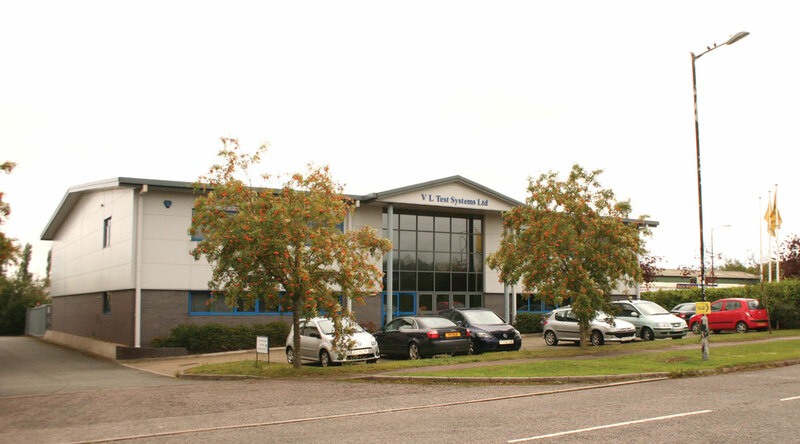 VL Test System’s headquarters in Buckingham. One of the company’s headlight testers in use. A play detector in use. 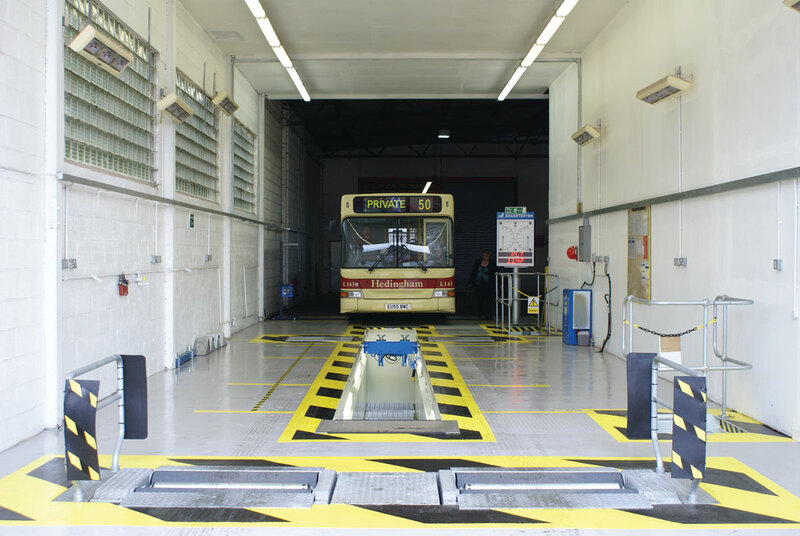 ATF lanes such as this are what the vehicle testing equipment supplier specialises in. One of the company’s engineering vans. Note the personalised number plate. 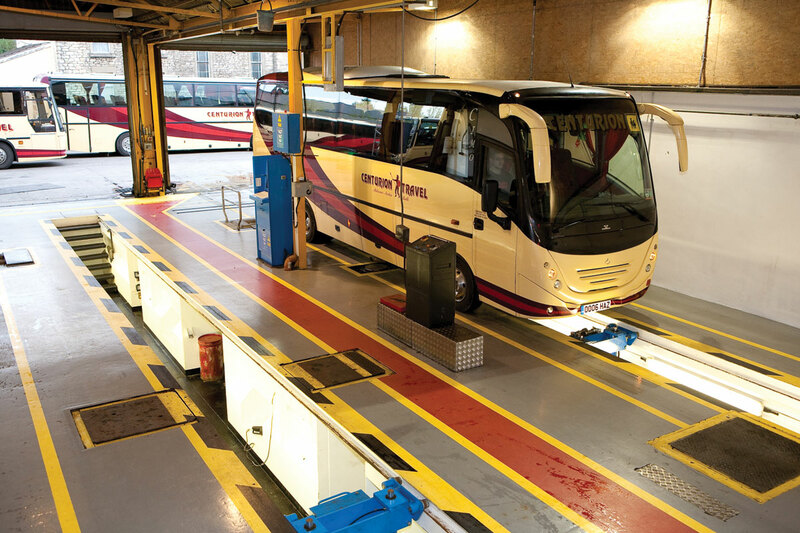 This space at Hedingham Omnibuses’ depot is about to have an ATF lane installed. The finished thing. 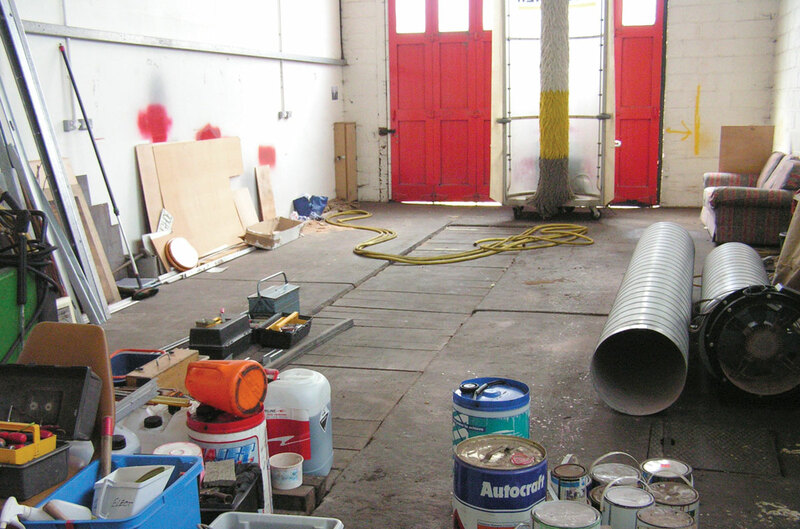 This is how the space looked like after the work was complete. With its headquarters in the Netherlands, VL Test Systems Ltd (VL standing for Van Leeuwen) has recently achieved 55 years in business. 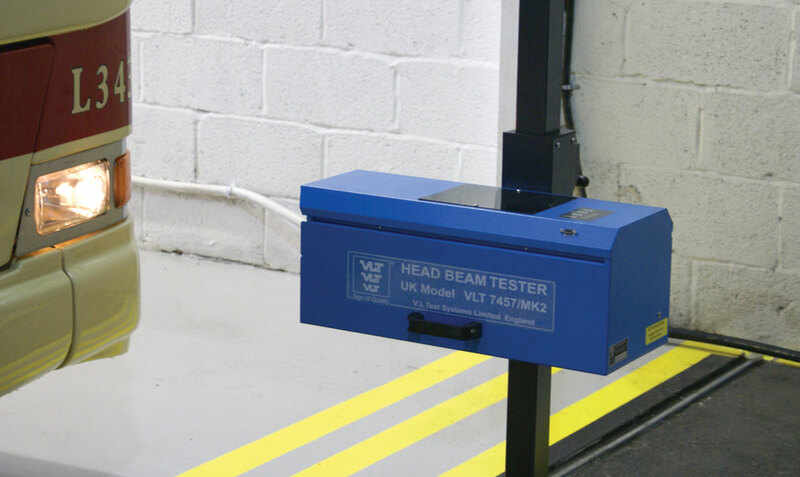 Specialising in supplying automobile testing and safety equipment, the company first came to the UK in 1989 on the back of a large VOSA contract for the supply of test lane equipment. B&CB visited its UK Manager, Brian Beacon, at its Buckingham headquarters to gain an insight into what it is that has kept the company thriving for so long, as well as what it can offer. 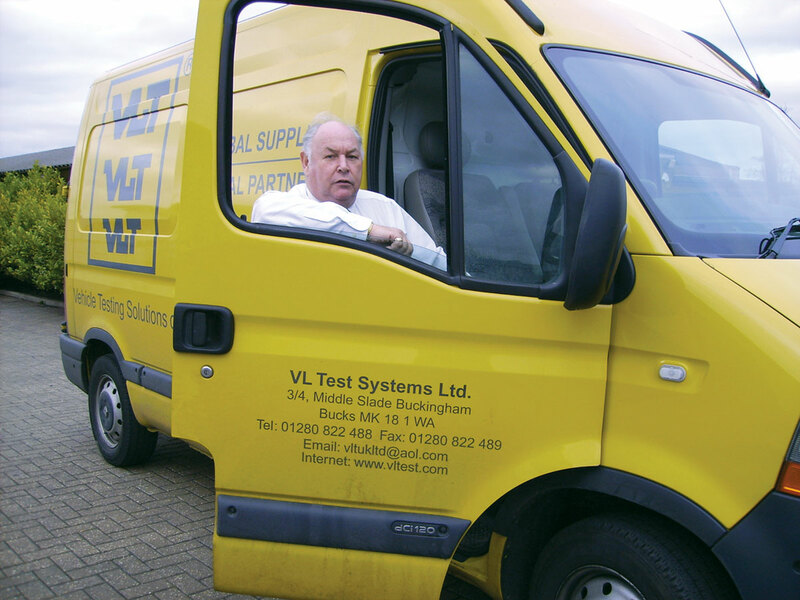 VL Test Systems Ltd (VLT) is perhaps most well known for its heavy duty roller brake testers for larger vehicles, which are specifically designed for the UK market. They are available with a 22inch TFT-LCD monitor. However, this is only the tip of the iceberg in terms of what VLT supplies. It can provide an entire VOSA standard Authorised Test Facility (ATF) testing lane from scratch, including all of the necessary equipment. Since 1995, VLT has been providing its Intelligent Test Lane Concept, an area it specialises in and one in which it is continually updating its products for. They are designed to lead to short test times; objective, operator independent results; accurate measurements; a large set of clear user instructions; a wide selection of different examination equipment; and a modular set up making its easily expandable and upgraded if needs be. They can also be linked up to government data bases. The entire system can be integrated to enable an entirely paperless operation. Even multiple test lanes can be added, making use of one computer per lane to test each vehicle independently. VLT also has an installation team which deals with all of the fitment and measurements for the equipment. The company can handle the entire project, taking note of the client’s needs and planning the whole lane from scratch, dealing with the civil works, right up to actually signing it off. It can even work with pit suppliers to organise the supply and installation of an inspection pit if required. Equipment VLT supplies for these lanes includes a vehicle identification station, a road contact suspension tester, a speedometer tester, a smoke tester, headlight beam tester, a play detector, a diesel smoke tester, and with a whole plethora of other testing devices. Although it can supply lanes for testing cars and motorbikes, its main market is for PCVs and trucks. It has been involved with Automated Test lanes for close to 20 years, having installed the very first one in Singapore in 1994. It is still in daily use. Commenting on his company’s equipment, Brian said it is perhaps some of the most expensive on the market, but claims it is certainly of ‘very good quality’ and uses some of the ‘most high tech equipment available’. He claims that even though they may cost more up front, over the years the better quality will pay off in terms of less maintenance and downtime. He highlighted the fact there are machines the firm supplied 25 years ago still in use. Brian claimed that the business also provides some of the best service back up on the market. For VLT, it is not a case of just selling the products. It claims to be the only manufacturer and supplier of vehicle testing equipment for safety and emissions in the UK that relies 100% on its own nationwide service network of factory trained engineers. It does not use sub contractors or third parties. 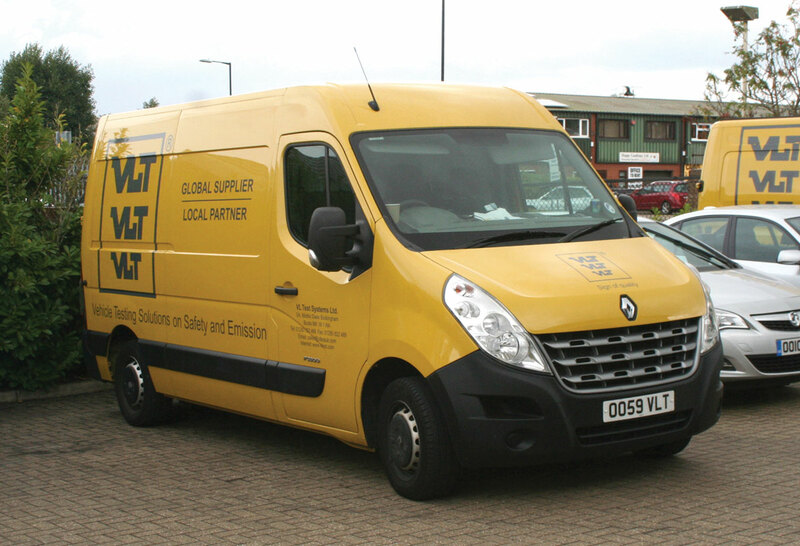 Situated throughout the country, the engineers drive a fleet of fully equipped Renault vans to carry out 24 hour service and calibration of the machinery. This dedication to looking after the products once they are in place is part of the business’s aim of forming a partnership with its customers. VLT’s products are all manufactured in house, mostly at its main factory in the Netherlands. Being self contained like this means it gains greater control over its production method and quality, buying in its own raw materials and developing its own software for the machines. It also means it can build products to order. Brian said there are not many companies in the workshop equipment supply industry that build and service their own products. In the UK, VLT keeps around £1m worth of stock in the store rooms of its Buckingham headquarters. Delivery of equipment can almost be within a 24 hour time frame, especially if it is already in stock over here. The UK premises occupy approximately 15,000 square feet and have been its home here since 1999. Previously, it had been based in a facility just around the corner from the current site. Employed at the operation are 32 staff altogether, including the 15 engineers (who work from home), four installation technicians and the sales and administration team. 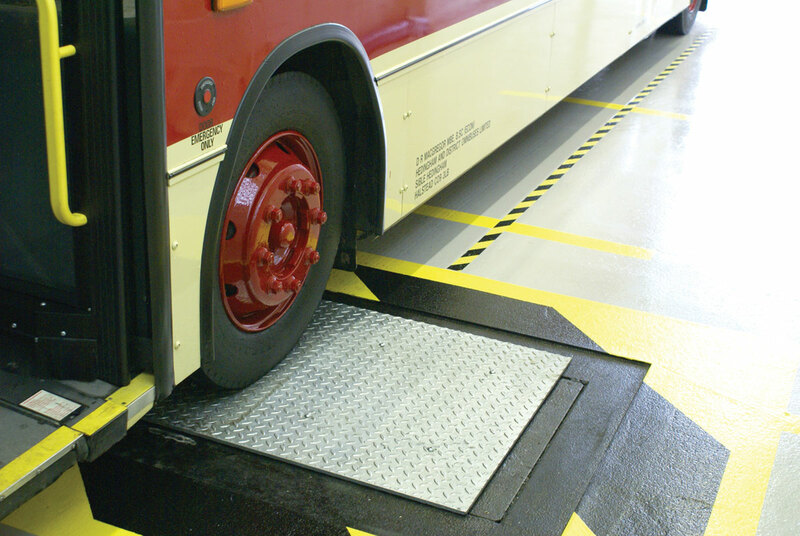 Products from VLT are proving popular amongst PCV operators, according to Brian. He said that in terms of the business he does with CV operators, bus and coach makes up around 50% of it, with truck and other commercials comprising the rest. VLT is the sole supplier to Stagecoach, he said, and it has also done a lot of business with some of the other major operators. It frequently works with smaller, independent companies too. Despite already having a sizeable proportion of its business coming from the bus and coach sector, Brian is always keen to expand even further and win new customers. The business plan is one of constant expansion, which it seems is paying off because turnover has increased every year since the company was formed. According to his estimations, around 85% of sales come from recommendations. The company is in the comfortable position of having a full order book, something a lot of companies these days would be enviable of. ‘We’ve not really felt the recession,’ said Brian. One thing that may be detrimental to business at the moment is the closure of VOSA test lanes. The agency has always been a good client of VLT, having maintained a relationship ever since they first entered the UK. To give some scale to the decrease in business from the organisation, Brian said the organisation used to have 165 brake testers with the company, now it is more like 30. However, this development has not had any real negative impact on VLT. In fact, since the closures it has actually increased business. With VOSA test lanes closing due to cost cutting measures, more independent companies are setting up their own ATFs, including some operators. Brian gave the example of Beaver Bus in Leicester, which has the company’s equipment installed. The testing equipment supplier has been busily supplying this new influx of customers brought about by this change, taking a ‘large share of this market’. It also finds itself refurbishing some of its older devices, many of which are being transferred to independent ATFs. In fact, Brian said his company is doing quite a few second ATF installations for companies, including one it is working on for a London operator. At the time of my visit, he said 45 ATFs were currently either being planned or actually being installed. Fitting your own ATF certainly has its advantages, according to Brian. The first benefit is being able to test your own fleet, which has become an even more attractive prospect to many, considering the amount of VOSA test stations that have closed. Testing in house saves on travel costs and also means an engineer or driver need not take a significant amount of time out of the workshop to deliver a vehicle to the testing station. Another problem is the fact many now face longer journeys to these facilities due to local stations closing down. It also means PCVs can be tested at more convenient times. The closure of the Agency’s lanes means more vehicles have to be squeezed into one facility, which often results in the testing schedule getting rather full up quite quickly. Trying to get a test appointment at short notice can be very difficult, especially at the busiest times of the year. Having your own ATF means no long waits and testing at whatever time suits the operation best. Installing an ATF also means there is now an opportunity to open it up to third parties, bringing with it the chance to earn a secondary income. The extra money this can bring should mean the lane pays for itself even sooner.